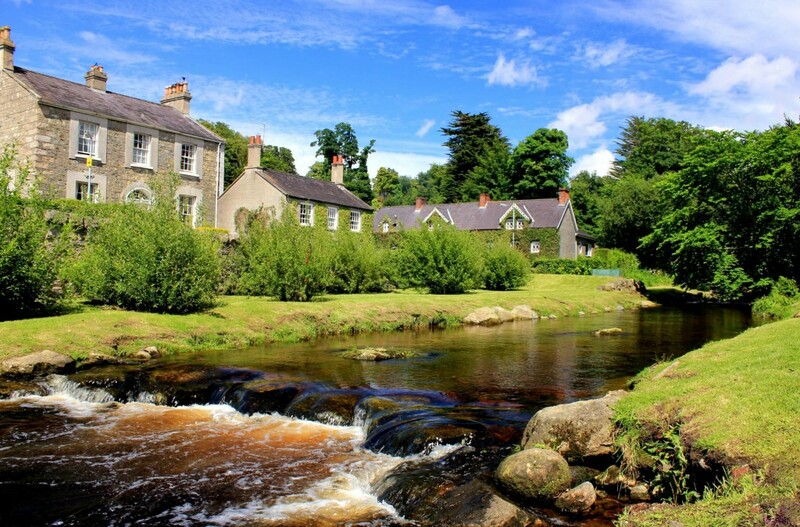 Walk along The Fairy Glen in Rostrevor, and enjoy the Yellow River as it runs through the Forest. Lying at the southern entrance to the Mourne Mountains, the picturesque village of Rostrevor is best described as the “sweetest little watering hole to be found in the three Kingdoms, and one of the most beautiful spots in the whole of Ireland” (Murrays Handbook 1896). In 1612 Sir Edward Trevor married Rose Ussher, daughter of the archbishpo of Armagh and it is said that he named the village after his new young bride. At the edge of the village on the road to Warrenpoint stands Ross’s Monument, a towering structure built in 1826 to commemorate the military exploits of local man Major General Robert Ross in Europe and the American War of Independence. In particular it celebrates his victory over the American forces at Bladensburg in 1814 and his entry into Washington on the same day. He is reputed to have burnt down the White House. Ross was fatally wounded at the Battle of Baltimore a short time later. Gerard Fay, a Rostrevor architect, travelled to Bladensburg to do some research on the incident, and to his surprise found a monument built over there, dedicated to the two soldiers that shot Major General Robert Ross! 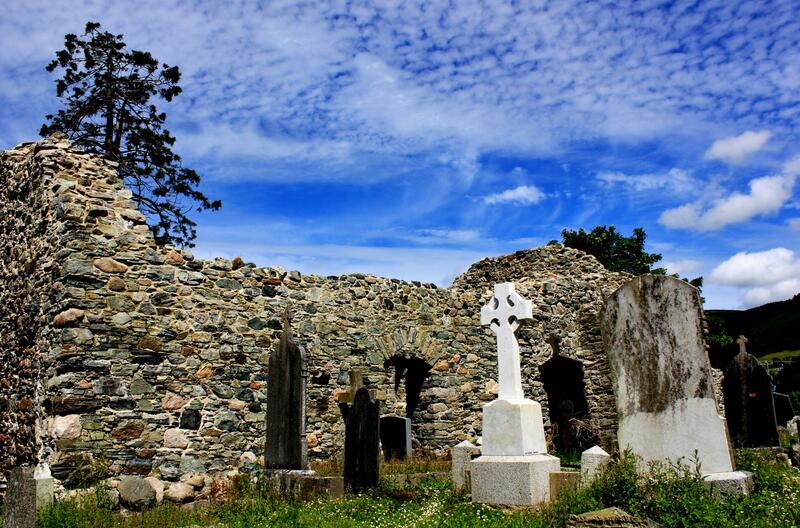 The Kilbroney Graveyard houses the ruins of the ancient church of St. Bronagh. Nearby Kilbroney graveyard on the Hilltown Road is especially interesting. Here may be seen the ruins of the church of St. Bronagh dating from the 15th century. Close at hand stands a huge pre-Norman granite cross.. Here too is the grave of Giant Murphy, a local man who was reputed to have been over 8ft. in height. He travelled the world displaying his enormous frame and came back to die and be buried in Rostrevor. The graveyard is also the site of the recovery of an ancient St. Bronagh’s Bell, lost for centuries and probably connected with the ancient church of St. Bronagh. A strange story attaches to the bell. It is a genuine example of the earliest Christian bells known in Ireland and was the gift of Fergus, a young chieftain. The bell had been hung in the fork of a young oak tree near the convent. The convent was subsequently destroyed but the bell remained hidden. For several centuries it was heard to toll through the valley on certain nights and this was explained by many stories of banshees and leprechuans. Then it became silent. In 1888 a giant oak fell in Kilbroney churchyard and when it was cut up the bell was found in the hollow trunk. It has been restored and is in use as an altar bell in Rostrevor Catholic Church. Some antiquarians declare its value to be priceless. Warrenpoint has a smaller promenade (suitable for prams and wheelchairs), a children’s plaground, and several cafes. East Coast Adventure have water sports equipment for hire on the beach opposite the Whistledown Hotel every day through July and August, with sessions on a Tuesday and Thursday evening, 7-9pm. Call into their office, just up the main street. On a sunny day, you can’t beat a traditional vanilla ice-cream from The Genoa, opposite the square. If you are from the island of Ireland, you will have done well to have escaped hearing about Newry in the past couple of years, as it is famed for its shops and great value. Two large shopping centres, The Quays and the Buttercrane, host an array of high street stores, from Topshop, to River Island, Marks and Spencers to Sainsburys, Boots to Debenhams, the list goes on. The town also has a good TK Maxx for those of you who enjoy the bargain hunt! The city also hosts good nightlife, with an assortment of places to eat and drink. The Quays has an omniplex cinema upstairs. This seaside town is a good option on both wet and dry days. On dry days, a walk along the promenade is a must, and is perfect for wheel chairs and prams. During the summer months, activities include pony rides on the beach, outside amusements, and Tropicana swimming pool (an outdoor swimming pool on the promenade). There are plenty of cafes and ice-cream shops. The promenade has a good children’s playground at the end close to the Slieve Donard Hotel, and there are several public toilets in the town. When the weather isn’t so good, Cocos indoor playground on the main street is a good option for children under 14. Newcastle is also a starting place for the walk to the top of Slieve Donard. The first part of the walk along the river is fun for children, however it isn’t suitable for the less able. Murlough Sand Dunes and Beach are on the Dundrum road out of Newcastle. This is a beautiful place for a walk, where you can view the Mournes sloping down to the sea. Directions: Two options for visiting Newcastle. If you turn right as you leave the cottages, this will bring you through the mountains, follow signs for Newcastle. Drive time will be about 25minutes. If you take a left out of the cottages, and a left in Rostrevor, this will bring you by the coast road past Kilkeel to Newcastle. Drive time about 40 minutes.